Last Novemeber I was working on a post for the Christmas season and I stumbled up this nursery that specializes in water gardens. It was chilly and cloudy but I couldn’t help but make a mental note to return during the warmer months to explore. 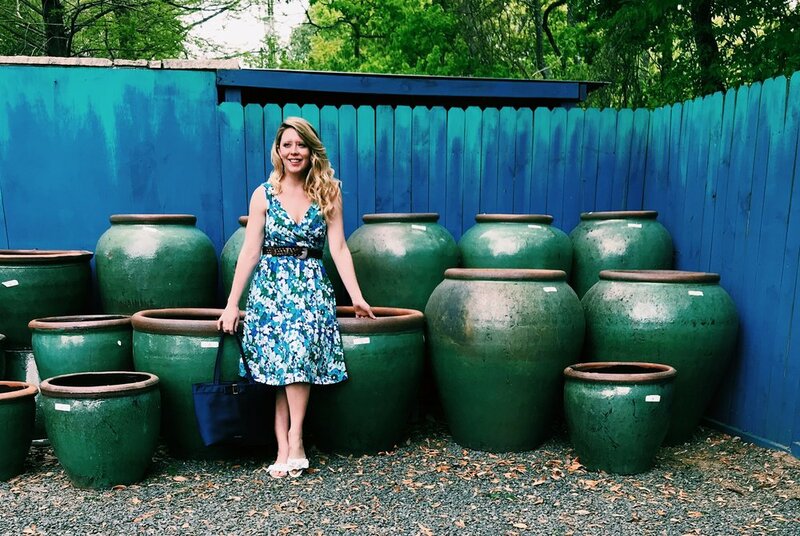 This week, I was out in Katy when I decided it was the perfect time to visit this little water garden and nursery. Let’s just say, I was not dissappointed! It was absolutely beautiful with a wide selection of plants, water garden supplies and fish! Fun fact: Waterlilies are my favorite flower! Waterlilies are such unique flowers. They have a root system submerged in wet soil underneath pond water. They grow all over the world and bloom in the Spring time. If you are driving through the country in Texas you will find entire ponds covered in hundreds of flowers this time of year. Although I do not currently have a place suitable to house a water garden, one day I hope to install one in my own garden full of koi fish and beautiful landscaping. I wore this lovely dress from Lands’ End. I really love the soft texture of the dress since it’s made of a knit jersey material. Perfect for warm humid days here in Houston! I’ve mentioned this over and over on the blog but natural materials like silk, wool and cotton are a must have for humid climates. You will sweat! During our Summer months temperatures raise above 100 degrees with 100% humidity. By selecting breathable fabrics you will stay cooler and more comfortable. Another thing I like about this dress is the fit and flare style. 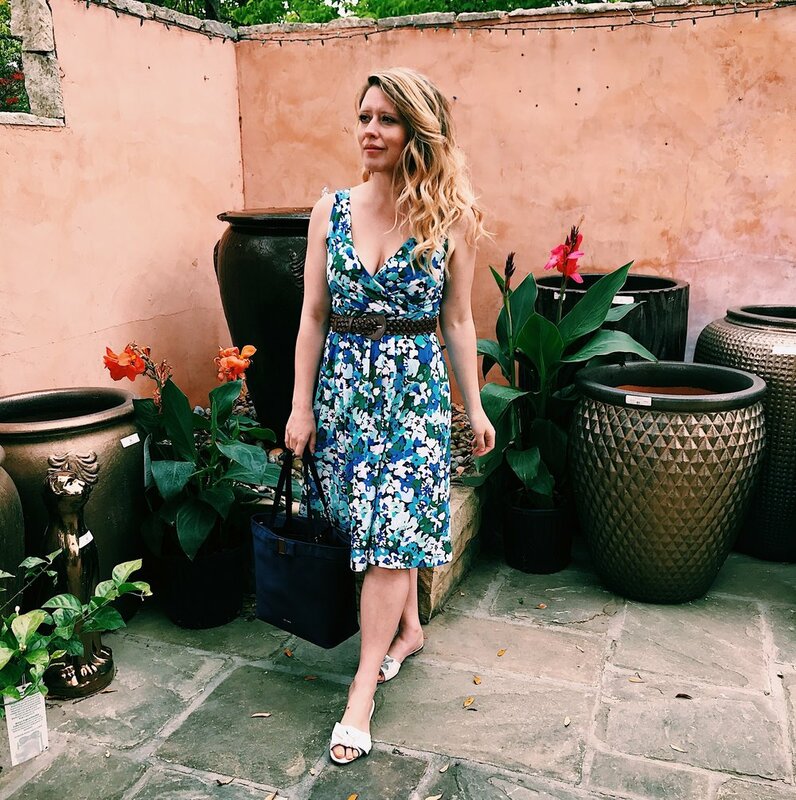 It’s classic, timeless and I see myself wearing this dress for years to come and I found it in a stripe pattern that is also perfect for Spring! To break up the pattern I added a leather braided belt. Belts work fantastic with this style of dress and add extra flair instead of wearing them alone. The casual leather braided belt dresses down this outfit and makes adding a pair of bow slides suitable for a weekend out exploring, traveling, shopping or brunch. I’ve had bow flats on repeat for the past month and rounded up several cute pairs above in the Shop the Post section! Since I knew I would be out and about all day I carried a medium size navy satin bag that comes with a removable clutch. Ted Baker has been one of my go to brands for over five years now. I really love the classic and feminine styles of the entire line but especially the purses. I’ve worn a pink one countless times for you guys on the blog and added this navy one earlier this year. The bag is under $100 and made extremely good! It also comes in a blush color! Nelson gardens has the sweetest and most helpful staff members. It’s a locally owned company located just outside of Houston in Katy, Texas. They have a store inside filled with garden decor and gifts plus a huge selection of nursery supplies. Whether you are looking to add a single hanging plant on your porch or build a pond here’s a fantastic place to visit. Their manifesto is to make gardening fun! I would agree, they do a wonderful job with their beautiful garden accented in shades of cobalt blue. As much as I love traveling all over the country every month, I also like to explore new scenes when I’m at home. I think no matter what size of city or town you live in there’s always an opportunity to branch out of your routine and find a new road to drive on, park to visit, or restaurant to try. It’s good for our brains to have new experiences and it’s been proven to help promote more creativity. Whenever I feel like I’m in a creative rut I head straight for a new location to gather inspiration. Where are some of your favorite gardens?